Collaborative Learning enables children to discover the secrets of subject specific topics whilst also improving language skills. Mantra Lingua's Collaborative Learning Library was launched in January 2012, with a great variety of activities that can be used for English, MFL, and EAL. You need to subscribe here to access and print out the activities for copyright reasons. Once you subscribe you will be sent a FREE PENpal (the full package with recordables stickers, four great pieces of software, re-chargeable batteries, USB cable etc. ), to truly enhance the Collaborative Learning process through narration captured in each activity. One of the free software is called ShareLINK. Here, schools or classes or individuals can upload their audio narrations or comments on any activity, for others to try with their PENpal free of charge. 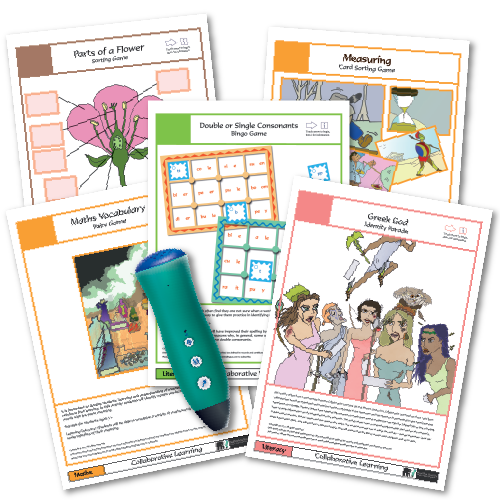 Ideal for EAL, since language versions of a game can be downloaded for interpretation of rules, names, and outcomes. This is a case of the EAL community sharing skills with one another, thereby enriching the learning experience. If you are a subscriber to the Collaborative Learning library (£110 membership with a FREE PENpal with labels and software), then you can download the pdf free of charge and print it out. But frankly, it is cheaper to buy the pack: all prints are made on cards which are longer lasting than photocopying paper. The cards are sound enabled for PENpal adding an extra dimension of narration, in English and other languages. All pictures are illustrated by professional artists. Game boards are laminated. Playing cards are perforated to give each a square edge. The whole package not only looks highly professional, but will last much longer. Every component is stored in an accompanying sealable plastic bag for easy retrievability. Each activity can be found in other languages using shared audio files for PENpal. So a Polish teacher, or Polish speaking Buddy, or a Polish EAL coordinator can translate key words and rules in Polish, and upload their version for others to share with the FREE ShareLINK software that comes with PENpal. If you have bought the activity you can also play it in Polish or any other language. Click here to find out more about ShareLINK.